Top Flight MMA fighter, Eddie Doud improved his unbeaten record to 3-0 this past weekend at Stellar Fights 21 with another dominant performance. I felt my performance was good, I'm feeling better and better each time I step in the cage the training at is really paying off. This past weekend Eddie "The Dude" Doud , of Top Flight MMA Academy in Belcamp Maryland, stepped back in the cage for another Muay Thai bout at the Milford Boys And Girls club for Stellar Fights 21. Looking to repeat his dominant performance from his last Muay Thai win in February, Doud had tough match up with Tabot Ako, of Team Ground Control. From the 1st round on, Doud and Ako let the fireworks go, neither fighter backing down from the exchanges. Doud ,with height and reach advangtage, opened up landing kicks to Ako's legs and body. Doud would also find success with is straight right hand. In the 2nd round Ako turned up the pressure a looked to overwhelm Doud with a fast barrage of punches. Doud would still control the case center of the cage and would land the cleaner shots. And in the 3rd and final round both fighters would leave it all in the cage. Ako found some success with his hook has Doud would unleash his own lightning fast combos. At the end of 3 action packed rounds all the judges scored all the rounds in favor of the winner, Eddie "The Dude" Doud, improving his Muay Thai record to 3-0 and his overall fight record to 4-0. 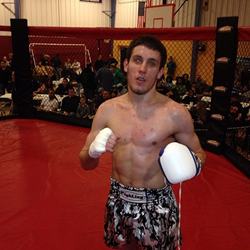 Doud had this to say about his fight," My opponent was real tough, he is the best guy that I fought to date. I'm pleased with the win. I felt my performance was good, I'm feeling better and better each time I step in the cage the training at Top Flight MMA is really paying off. Stuff is clicking easier so I'm excited about getting back to the gym improve more and continue to grow." Doud looks to continue win streak later this month as he competes against some of the nations best at the WKA Nationals at the end of the month.